The Remnant Newspaper - Henry's Revenge: Pope "Streamlines Annulment Process"
Henry's Revenge: Pope "Streamlines Annulment Process"
"Oddsfish, Chuck! Let's just call it 'annulment' then..."
Early reports are in, and it looks like Pope Francis, as expected, has radically reformed the process by which Catholics may annul their marriages, streamlining steps that many liberals in the church considered too cumbersome. The move is the latest in a series of public relations initiatives, whereby Francis hopes to make his pontificate appear more responsive to the needs of lay Catholics, especially those who have "long felt marginalized" by the hierarchy (READ: Don't like Catholic moral theology). • Giving bishops the ability to fast-track and grant the annulments themselves in certain circumstances -- for example, when spousal abuse or an extramarital affair has occurred. The Pope's reforms came Tuesday in the form of two "motu proprio" documents, Latin for "by (the Pope's) own initiative." They become part of Catholic canon law on December 8, the beginning of Francis' declared "Year of Mercy." REMNANT COMMENT: We'll have to wait for the official translation later today, but this already promises to dramatically undermine marriage, especially in third world countries where the annulment process is less popular and marriage vows are stronger. And of course the Holy Father is adding a “lack of faith” to the growing list of trumped-up reasons to conclude there was never a marriage in the first place, as well. At the end of the day, if you WANT an annulment you GOT an annulment . . . but let’s not call it “divorce”. Heck, no! That would tamper with the indissolubility of marriage! By the way, what about those of us who feel marginalized for believing as Catholics believed for thousands of years, that marriage vows actually mean something, that only death can break them, that we are married in the eyes of God, that there is no opt-out clause? What about us? What about those who follow the rules and take marriage seriously, and who firmly believe that "streamlining the annulment process" is just an embarrassingly transparent euphemism for on-demand divorce for Catholics? Any chance of us getting a little mercy up in here? No? I didn’t think so! What a joke! 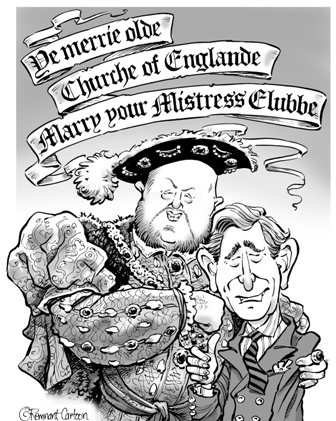 How the halls of hell must be echoing with the booming laughter of old Henry the King of England. Well played, Francis. You've done it again!